The 43rd Edition of America's Bestselling Antiques Annual! "The Kovels are arguably the authorities on antiques and collectibles in this country." "The Kovels focused overwhelmingly on ordinary things for ordinary collectors, the artifacts of everyday American life." Kovels' Antiques & Collectibles Price Guide 2011 (ISBN: 978-1-57912-853-1; PB; $27.95, Black Dog & Leventhal), the 43rd and newest edition of what The New York Times called "the bible of the field," returns as the best-known price guide in antiques and collectibles. All prices are culled from actual sales from the past year. As with every edition, Kovels is completely new from the ground up with all new prices in over 775 categories. Best of all, the prices are real—there are no estimates. Antique hunters and collectible hobbyists can easily browse more than 42,000 prices and 2,600 color photographs, plus hundreds of expert tips and informational sidebars, countless cross-references, record-setting prices and a comprehensive, computer-generated index. 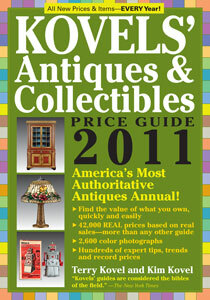 The 2011 edition has more tips, marks, logos and photographs of individual items—in all price ranges—than any other price guide, and readers can use this indispensable reference as a companion to the Kovels.com website (www.Kovels.com). The user-friendly Kovels is organized into over 775 categories that cover an enormous range of interests—from Art Pottery to Depression Glass to Furniture to Jewelry to Sports Memorabilia to Toys. You can find almost anything in Kovels. A 3-foot-long brass safety pin sold for $94. A brass Victorian "skirt lifter" shaped like a hand is $285. There were even antique brass knuckles that sold for $690. The highest priced piece was a Tiffany Laburnum lamp for $422,500. The lowest price is 15 cents for a 1950 milk bottle cap for Morill Milk. As useful to the newest collector as it is to the experienced dealer, Kovels' Antiques & Collectibles Price Guide 2011 is the book to take to flea markets, garage sales, auctions, antique shops or shows, whether you want to buy, sell, evaluate or collect with confidence. Terry Kovel has been a lifelong collector and has written more than 98 books on antiques and collectibles. She also writes "Kovels: Antiques and Collecting," the oldest nationally syndicated newspaper column that is still written by the original author. Her expert advice is in Kovels on Antiques and Collectibles, a monthly newsletter that has over 50,000 paid subscribers, and a weekly ezine, Kovels Komments, that boasts over 200,000 registered users. Until the fall of 2008, when Ralph Kovel, Terry's husband, died, all Kovel ventures and adventures were the work of this indefatigable husband-and-wife team. Now Terry continues to spearhead the Kovel enterprise along with her daughter, Kim Kovel. Terry lives in the Cleveland area. Kim Kovel, daughter of Terry and Ralph Kovel, caught the collecting bug as a child, growing up in a house filled with antiques and traveling regularly to antique shows and flea markets. She manages the Kovels website and has spent the last 10 years working on the Kovels price guides and other Kovel projects. She lives in a fifties house in Florida. To see this press release as a PDF click here.